Thank youu !! and Happy new year (2014) !! People have decided to distract the Titans to the builder can build great walls were killed only 4% of the population during the construction of the walls by the Titans who ate builders. The only way to defeat the Titans are: Maneuver-dimensional and sharp swords. 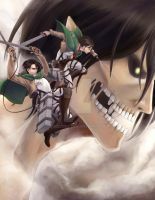 However, only 2% were killed the Titans with what the rest stood against the wall to try to destroy it. But in 900 years, human population grew by 2% over what was already quite a lot of people, humanity has decided to call its secret orenż and knock the Titans at the end. It worked ... but there were too many victims and human population decreased by 1.2% over that mankind had to rebuild. the detail that went into this is phenomenal!! Amazing work!! Jus.. Just.. Awesome!!! cx very very nice!! Awesome work love the details! Awesome! and i love the details! Omg it looks amazing! I love this art so much! This is just... amazing ;A; An amazing job! ò///ó Congrats<3. I´m glad you like it ! thank you ! Wowwww !!!!! > < It look so awesomeeeeeeeeee!!!!!!!!!!!!!!!!!!!!!! wow thank you I´m glad you like it ! wuohohou thank you very much for your words I really apreciatte it ^^ ! "Sie sind das Essen, wir sind die Jäger!" The realism and the amount of detail is simply fantastic. hostia Szhov ! muchas gracias ! !